Nebraska offers a variety of traditional festivities which visitors and residents alike can enjoy to celebrate the best holiday of the summer—Independence Day! Fireworks and parades remain the hallmark attraction and the state offers no shortage of these spectacular events. Here are the best ways to celebrate the Fourth of July in Nebraska! Celebrate Independence Day at the Omaha Henry Doorly Zoo and Aquarium this year. Fun activities include special encounters with animals for all ages. The first 1,000 guests will receive a free Independence Day gift provided by the Oriental Trading Company. Even activities are free to Henry Doorly Zoo and Aquarium members or with a regular paid Zoo Admission. Since 1868, the small town of Seward has celebrated Independence Day with family-friendly events and attractions. The celebration has expanded each year and now draws crowds upward of 40,000 people. From free movies at the Rivoli Theater and a grand parade to live entertainment and a firework display, this is a summer celebration not to miss! This huge event takes place at Bellevue Downtown Park and goes from the afternoon and until the fireworks show. Enjoy a day filled with musical performances of all different genres, inflatable games, and caricature artists to excite the kids, food vendors to excite everybody, and plenty more. End the night with the regionally-respected “most spectacular” firework show which takes place as the Bellevue Youth Symphony Orchestra performs. Put on by the City of Bellevue and Bellevue Downtown Association, this is a spectacular festive event that you and friends and family won’t want to miss! Nebraska’s largest Independence Day parade is held every year in Ralston. At this exciting community event on July 4 there will be food, music, and a spectacular firework show to end the night. Other activities include an outdoor beer garden and live music at the Legion and fire department water fights! Every year at Ameritrade Park in Omaha, the top hitters in college baseball converge for the annual Home Run Derby which will also be streamed live on ESPN. The family-friendly event will conclude with the Annual Omaha World-Herald fireworks display! Sponsored by the Veterans of Foreign Wars, the city of Fairbury is hosting a massive flea market featuring over 300 vendors on July 3 and July 4. The Shriners Parade will begin at 10 a.m. and there will be a firework display at dusk. Camping is also available at the Crystal Springs campgrounds. 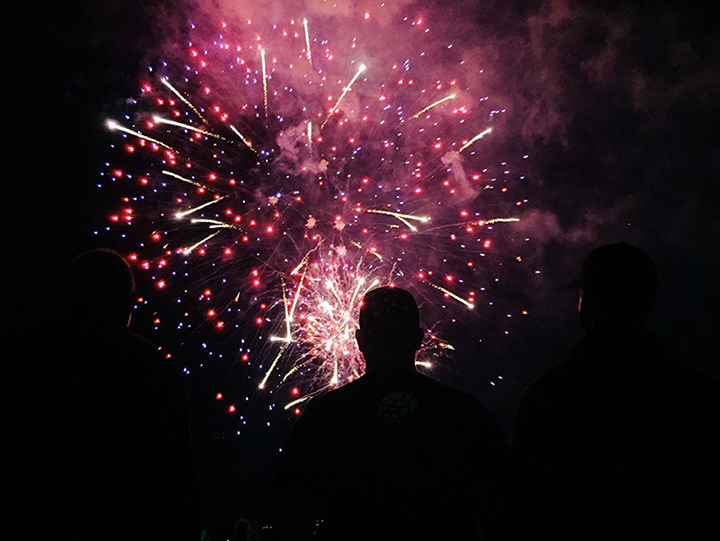 For another fun fireworks option, head to the ballpark on June 29 (and any other Friday) night to see the skies light up after the Omaha Storm Chasers game! A baseball game followed by a firework spectacular is about as American as it gets! All of Northwestern Nebraska will celebrate America with a variety of events hosted in Crawford. Rodeos at the Crawford Rodeo Grounds, an art show, a parade, and much more will take place June 30 through July 4 this year. This year, a full day of celebration and festivities will take place in Alma, including a 10K/5K fun run, an Independence Day parade, arts and crafts vendors, food, and an impressive firework display over the water at Harlan County Lake. Don’t miss this family-friendly event! The Nebraska Wind Symphony (NWS) will be hosting free summer concerts, including one on July 4 at 6 p.m. with the NWS Swingstones Big Band. The performance will be held at the Chalco Hills Recreation Center. Bring a picnic and friends and enjoy a free patriotic show! View more Nebraska July 4th Fireworks and Celebrations.